Days seem shorter, nights are colder and trees have started to lose their leaves… There is no doubt Fall is upon us. Fall: the perfect excuse to bring boots back into your daily attire! Boots are my second favorite style of shoes (gotta love my heels!) andÂ colder weather is just the excuse needed to wearÂ them more often. Â Browse below and find a fewÂ of this seasons hottest boots, or skip below for great tips on wearing them. Black boots are a classic, but if that’s all you wear it’s time for a little change! Try a camel-colored or dark brownÂ boot instead. Still neutral colors and they won’t get lost if you wear them with black skinny jeans/leggings. If you are really looking for a change from black, don’t be scared of color and try a red/burgundy boot. Tall boots look great with just about any outfit. Jeans (skinnies or bootcut work the best), skirts, dresses, shorts. For a dressier look, go for boots with a heel and pointy toe. AnkleÂ boots can also go with most outfits, but I think they look their best with leggings or a short dress/skirt. TheyÂ can make you look wider if you wear them with a long and flowy dress or skirt.Â ForÂ a cute & comfy look pair short booties with leggings and an off the shoulder top or oversized sweater. Opt for leather boots over suede ones for easy-care. 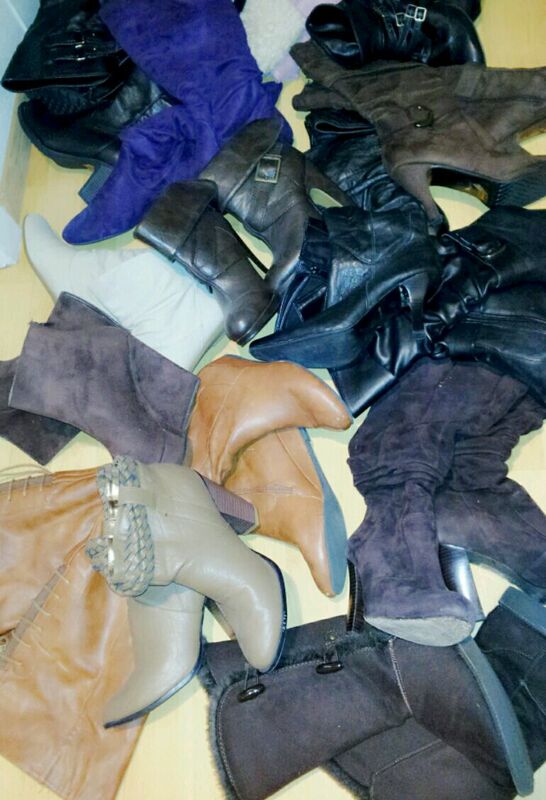 And if it’s raining, always be sure to dry off your leather boots copletely before storing them in your closet. Wet boots in a cool environment can harvest mold. You can also purchase a water-repellent coating to protect both suede and leather. 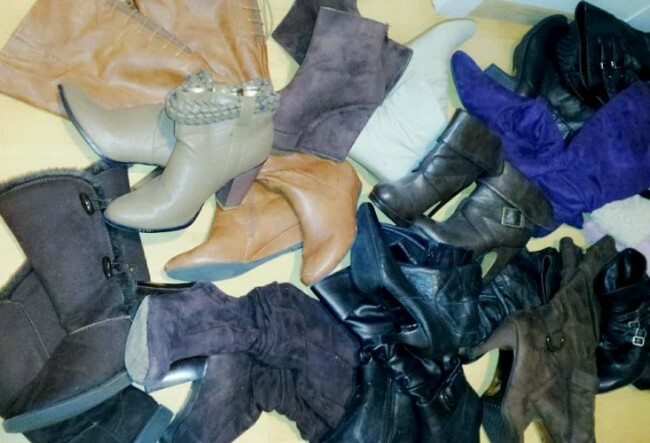 The best time to buy boots on sale is usually aroundÂ the end of Winter andÂ Summertime. Â Never go barefoot in boots, especially leather. Boots trap more heat and don’t absorb prespiration, meaning it will make for both stinky feet and boots. 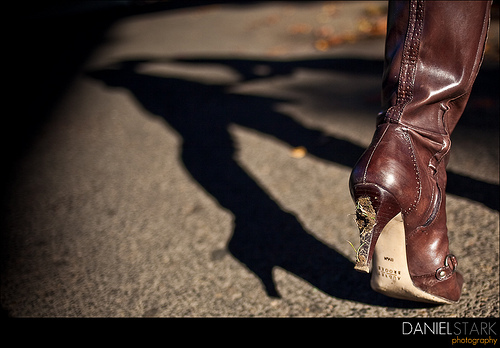 If possible, always try your boots on prior to buying or look for ones made of soft leather or with adjustable laces. This precaution is to ensure they fit around your calves, some boots are designed for ultra slim legs and won’t zip up if you have curvier legs. If you are on the shorter side, thigh-high boots can be tricky.Â You can definitely pull themÂ off dressed and accessorizedÂ to accentuate them, butÂ it can beÂ tough to not look stocky. Avoid wearing thigh-highs with mini skirts, instead use leggings or skinnies and pair with a loose top. For tall boots, top your outfit with a blazer for a polished look or a leather jacket for a casual look. Keep accessories simple and minimal. Your boots will be the center of attention, especially if they have studs, chains or are in any color besides black. Which makes accessorizing easier, keep it simple by looking for a nice pair of dangling earrings or a nice long necklace instead. My favorite style of boots is tall with a heel and round or pointy toe. I own various styles, but most often find myself grabbing for tall brown or black ones. The best tip for finding the most flattering boots for yourself is to try tons of them on. See which styles look best on you and which ones just don’t work. Don’t give in to trends and opt for what looks and feels best on you. Got any tips of your own? !